Toscana is a luxury waterfront community comprised of three high-rise condo buildings in Highland Beach, Florida a town located in the southern portion of Palm Beach County. Also known as Toscana Towers, Toscana sits on the west side of A1A right between the Atlantic Ocean and the Intracoastal giving almost every condo a stunning view of the water and city. The gated Toscana Towers are the most recently constructed luxury waterfront properties to hit the heart of Highland Beach where residents can enjoy recreational activities, fine dining, and upscale boutiques at Mizner Park and Royal Palm Plaza for a unique shopping experience. All 421 units have access to a grand lobby, private elevator, impressive finishes, open floor plans, and superior artistry. 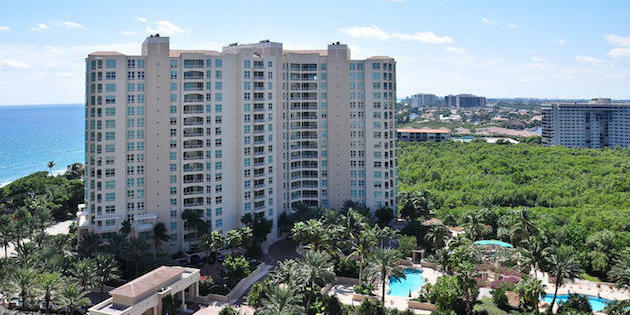 The gated Toscana Condo community features three outstanding heated swimming pools with beautiful sundecks, and umbrella shaded chairs along with admission to its exclusive Toscana Beach Club. The Toscana Beach Club is a Mediterranean inspired beach club located directly across from the spectacular shores of Highland Beach with access for Toscana Condo residents only. Beyond the sandy beaches, residents can enjoy luxury amenities like a beachside towel and drink services, beach chairs for comfort, and private locker rooms with a sauna, steam, and showers at the Toscana Beach Club. Toscana Condos are some of the best real estate Highland Beach has to offer with 9 foot high coffered ceilings, solid core double door entries, granite countertops, custom marble baths, spacious terraces, and stunning living spaces with astonishing views of the coast. Each condo also has custom vanities, his and her walk-in closets, and a full side-by-side washer and dryer. Not only do Toscana Condos offer a full-service concierge community with valet parking, but they also have an underground garage, full-time security, and full-time staff who are always at your service. This community has a 24-hour manned entrance with gate and lobby to ensure the residents’ safety. There is something for everyone at these luxury waterfront condos. Residents can take lovely strolls along the walkways that line the extravagant lawns, or for residents who are little more active, there are two tennis courts, a top-of-the-line fitness center, billiard lounge and party room for their enjoyment. At Toscana, there are also putting greens, beauty salon, child care, and room-service. A few pets are even allowed for those residents with a furry pal. The Boca Museum of Art, Morikami Japanese Museum, Kravis Performing Arts Center, Norton Museum of Art, and Broward Performing Arts Center are all cultural attractions that are close to the Toscana waterfront towers. Outside of Toscana, residents can also join the nearby Boca Raton Resort & Club which has 5-star amenities of its own along with prestigious golf and tennis. Toscana Condos in Highland Beach have easy access to I-95 and are just a short distance away from both the Palm Beach International Airport and Fort Lauderdale International Airport. These luxury condos are zoned for all A-rated schools including J.C. Mitchell Elementary School, Boca Raton Middle School, and Boca Raton High School. If you are looking for luxury waterfront living in Highland Beach at its best, look no further than Toscana Condos.